Dropbox is one of my favorite little pieces of software. It’s practically invisible, silently keeping your dropbox folder synchronized on all the computers you have it installed on (Windows, Macintosh, or Linux). I can’t recommend it highly enough. Because Dropbox is so easy to use, it’s easy to forget that it’s also very powerful. Here are two three advanced ways I’m using this great utility. There are dozens, maybe hundreds, of pieces of software that will securely store passwords and other information you want to keep secret (credit card numbers, etc.). I stumbled upon what might be the simplest possible solution. Note: You could also use your Dropbox to sync a Trucrypt archive or a KeePass database file, but both require additional software to decrypt the contents inside. On occasion while at work I think of an audio or video file I’d like to download via BitTorrent. In order to take it easy on our office network though, I’ll start the download from my work computer and have our iMac at home do the real work. Here’s how that works. If you wanted, you could simply set your watch folder to your Dropbox or one of its subfolders. Then, on the remote computer, you just download the .torrent file and drop it into your Dropbox. Within a few seconds, it will get synchronized with your other computer, which will then start the BitTorrent download as soon as Transmission sees the torrent file show up in the Dropbox folder. I added an extra step in my workflow. I’m a user of the rule-based Hazel utility that lets me trigger actions when certain events happen. In this case, I actually have my Transmission watch folder set to a subfolder of my Downloads folder for organizational. When a new torrent file shows up in my Dropbox, I have a Hazel rule that catches this action and automatically moves the file to the watch folder. Once this happens, I instantly get feedback on my remote computer, as Dropbox will inform me that the torrent file has been removed/deleted on both computers. This lets me know my download has started on the iMac. One of the least mentioned new features of iTunes 9 is the addition of a watched folder to allow you to automatically add music to your library. Add Dropbox and a Hazel rule and you’ve got the ability to update iTunes from another computer. 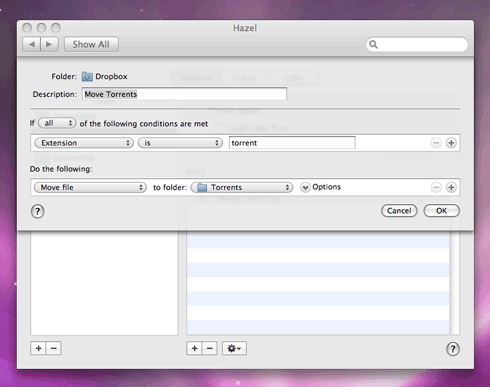 For this tip, I added a subfolder to my Dropbox simply called Music. This is where I move music files on the remote computer that I want added to iTunes library on my Macintosh. To test it out, drag one or more MP3 files into your Dropbox Music folder on your remote computer. Once the files have finished syncing, you should get notified that they have been deleted from the Dropbox. 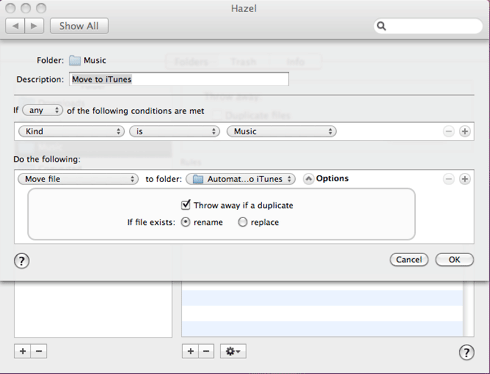 This means that Hazel has done its job and moved them out of Dropbox and into the iTunes watch folder. After that, it takes only a few seconds for the songs to appear in your iTunes library. So, there you go – two three clever uses for your Dropbox. There are lots of other tips and tricks too, if you’re interested. If you don’t have one yet, now’s a great time to signup for a free account.